We represent the entire collection of Judy Larson. then spent the next 17 years as a commercial artist, illustrator and art director. --a technique that can render magnificent detail but one requiring infinite patience. Scratch board, an old, but little used medium, consists of a smooth, thin surface of hardened China clay applied to a board. The subject is then painted solidly with black India ink to create a silhouette. are diverse. 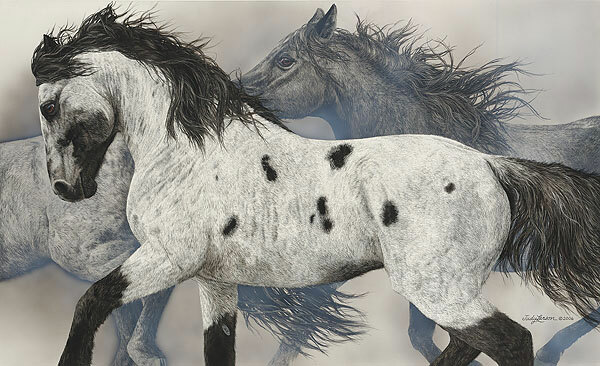 Judy prefers a combination of airbrush, gouache or acrylics for finishing, with frequent rescratching for detail. Scratch board is a demanding medium, one that Judy has used masterfully in developing her unique approach to wildlife art.